Flinging those much-reviled miniature boxes directly into the closest garbage can was the far more appropriate, time-saving action. Even when afflicted with absolute sugar desperation, you could attempt to vigorously chew the white and Pepto-Bismol tinted, candy coated, black licorice bits and still end up swallowing them partially whole thanks to their chronically stale state. Someone out there must still have a soft spot for Good & Plenty based on the fact that – even in 2012 – the purportedly edible yet rock-hard classic is inexplicably still available at a wide range of mass merchandisers. For the rest of us, there is Pandaâ€™s Candy Coated Licorice, and oh, what a relief it is. There are several ways in which the Finnish companyâ€™s latest greatest entry blows Good & Plenty straight out of the water, the most obvious one being that each individual candy-coated piece is easily twice the size of its pitiful forerunner. With a legitimately soft and chewy black licorice interior – flavored with genuine rooty goodness â€“ there is far more toothsome, easily pliable, unrefined sugar to love. As candy selections go, Panda’s Candy Coated Licorice is a bit healthier than typical marketplace offerings based on the fact that it is absent of high fructose corn syrup, artificial colors/flavors, or preservatives. When seeking out authentic-tasting black licorice, molasses should be the main sweetening agent, as it is in this product. The thick brown highly concentrated syrup – which is a by-product of the sugar refining process – is conveniently rich in beneficial minerals such as manganese, iron, copper, magnesium, and potassium as well as calcium but it also happens to impart licorice with that unmistakable earthy flavor. What else makes Panda’s sugar coated escape well worth hunting down at your favorite market? Well, if you walk the dietary straight and narrow by actively avoiding all animal-based protein sources, you’ll be happy to learn that their Candy Coated Licorice is 100% vegan-friendly. You won’t find a scrap of gelatin in it, nor eggs or milk for that matter. Let’s put aside the “health” aspect of this treat and get down to the sugar nitty gritty. Each piece of Panda’s licorice is dunked in a crisp yet easily yielding sugar shell. Somewhat surprisingly, the light yellow coating is distinctively citrusy, with a sharp yet pleasing lemon edge that youâ€™ll want to experience again and again. On the opposite end of the tasting spectrum, the white shell surrounding Pandaâ€™s perfectly textured, molasses sweetened licorice is laden with anise and peppermint, both of which would complement a cup of tea quite nicely. 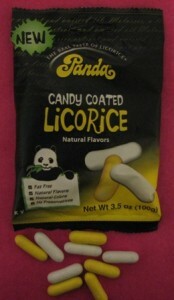 Even on their own, Pandaâ€™s refreshing white candy coated licorice bits would make an excellent after dinner mint. Each relatively petite 3.5 ounce bag, priced at under $2.00, makes absolute mincemeat of the candy-coated licorice competition. Instead of working overtime to pawn your Panda morsels off on the sugar-clueless, you’ll realize with the very first bite that these ebony gems are in a hoard-worthy class all of their own. Reading your review makes me want to run out and get some Panda candy coated licorice. Except I don’t like licorice. You might change your mind if you dipped your toe in these licorice waters, but I realize that it’s not for everyone. I wish Panda had mini sampling packs for licorice haters — maybe they’d have a lot more converts! I just tried Panda Blueberry licorice which was tasty. Now I need to find these. P.S. I used to work with a guy who always ate Good & Plenty and I grew to like them.